Tired of my daily humdrum, I decided to escape to Victorian London for a while, by reading all of my Sherlock Holmes. This time though, I was going to make notes! And then it dawned on me, that I already had a comprehensive set. I had, along with my copy of Peter Bevelin’s fantastic Seeking Wisdom, also purchased a copy of his A Few Lessons from Sherlock Holmes. Bevelin synthesizes not just Sir Doyle’s works, but also pulls related information from a wide variety of sources, like Joseph Bell who was Doyle’s inspiration for Sherlock Holmes and Edgar Allen Poe and Michel De Montaigne. This is ergo more a book recommendation, than a book notes post. Most everything that I could hope to capture, is already in this slim volume. And just like Doyle’s books, this one is worth coming back to over and over again. I’m Catholic and as a child, I was somehow naïvely proud that Christianity was the largest religion in the world. We were good people. We were morally superior. After all, we were the righteous chosen ones! Our crusades were what helped Christianity become foremost and widespread! All those knights in shining armour and all those devout folk went from their homes in Europe to battle the bad Muslims and conquer Jerusalem. It was stuff of heady, wild fantasy! Time has slowly cured me of my delusions, but the curiosity has always remained. Why did these two religions who had so much in common, go to war for centuries? And the answer after ripping through the book is realistic disappoinment. For all that many, maybe most Franks and Muslims wished it to be so, the realities were rather different. This was not a clash of Islam versus Christianity. It was at best a clash of specific Frankish polities warring with specific Muslim ones, where universal claims to religious truth or holy war almost always took a backseat to specific regional and political interests. They do outright injustice to the more nuanced, less dramatic, but nevertheless authentic decisions made by generations of medieval Christians, Muslims, and Jews involved in this history. The Crusades, understood from any perspective, cannot shed light on modern struggles, and their motivations cannot be legitimately claimed as background or inspiration for contemporary conflicts. Medieval Muslims and Christians went to war for their own motives, not ours. Bashir saw the strange spectacle of the Frankish lord of Antioch marching alongside Muslim troops from the lord of Aleppo, arrayed in battle against the sultan’s representative, the Muslim lord of Mosul, who marched with his own Frankish allies from Edessa. It was just humans … being humans! But don’t let that stop you from reading the book. Paul M. Cobb weaves magic with this well researched work. While it may seem like I took a while with the book, the reality is that this is a page turner for any history buff. I had to slow down consciously because I did not want it to end! Ranging from Spain to Africa to the Middle East to Mongolia and from the year 750 to 1492, he explores whole host of places, events and people. Action abounds! Treachery, back stabbing, sieges, plague, naval battles, battles in the plains, battles in the mountains, fire, it’s all here! And while it is about humans being humans, I found it quite enjoyable as I kept switching sides throughout the book, rooting for who I thought, was doing the right thing at the time. It gave me a perspective on how the “other side” sees these events and it looks suspiciously a lot like mine. The real difference between us and chimpanzees is the mysterious glue that enables millions of humans to cooperate effectively. This mysterious glue is made of stories, not genes. We cooperate effectively with strangers because we believe in things like gods, nations, money and human rights. Yet none of these things exists outside the stories that people invent and tell one another. There are no gods in the universe, no nations, no money and no human rights—except in the common imagination of human beings. You can never convince a chimpanzee to give you a banana by promising him that after he dies, he will get limitless bananas in chimpanzee Heaven. Only Sapiens can believe such stories. This is why we rule the world, and chimpanzees are locked up in zoos and research laboratories. God said, ‘I need somebody strong enough to pull sleds and find bombs, yet gentle enough to love babies and lead the blind. 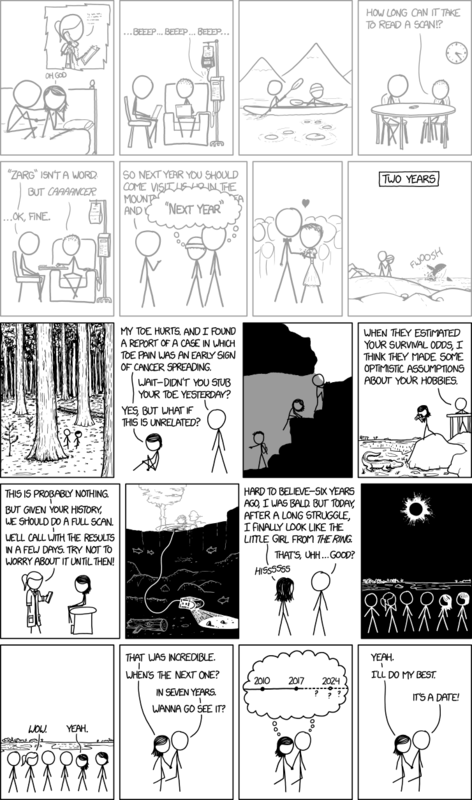 Randall Munroe posted this yesterday1 methinks, or the day before. When Abby was diagnosed with cervical cancer two years ago, the docs said we should be grateful, she had the non life threatening kind. Even so, the last two years have been full of ups and downs and lots of uncertainty. I think I understand a little of what Becky & Kate are going through, having gone through some of it ourselves. And I have no words to express what Becky must be going through or how Kate must be holding up. And Abby, 2018? It’s a date!